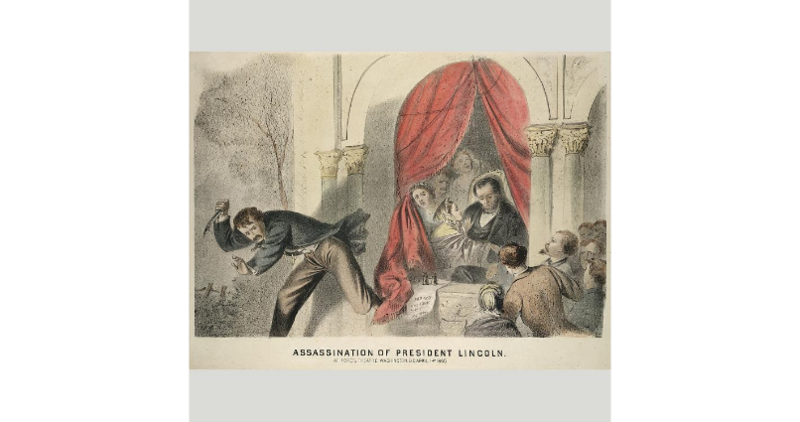 This Tuesday, April 14, is the sesquicentennial of the assassination of Abraham Lincoln. During the past few years I've been doing another blog, Michigan's "Fighting Fifth" Civil War Infantry, of Detroit newspaper articles about that particular regiment in the pace at which they were published. Along the way I've repeatedly mentioned how the Detroit Free Press was a "Copperhead" newspaper, in opposition to Lincoln and the war. Next week, starting on April 15, I will feature there the front page of the Free Press for April 15. If anything shows the local reaction to the assassination, it does. 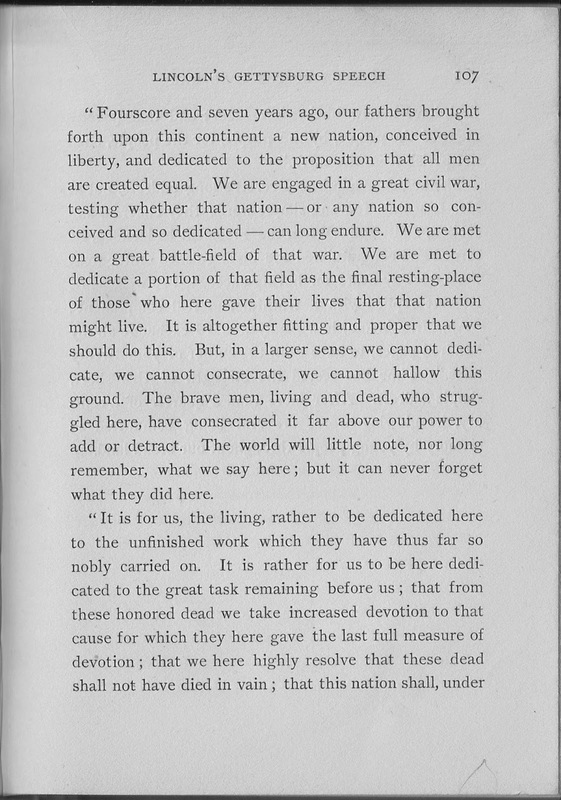 Today I want to take a step back to observe Lincoln in some of his final public speeches. 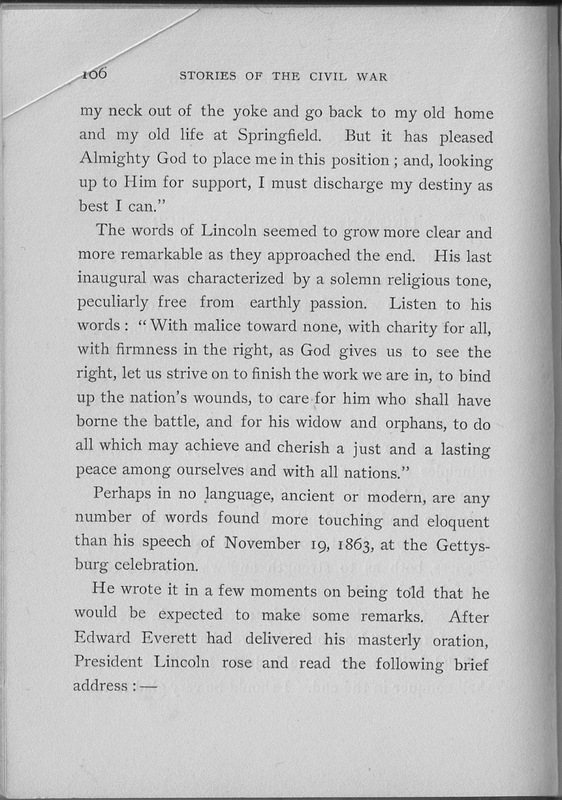 I'm grateful that Albert Blaisdell included mention of Lincoln's second inaugural speech in his brief story, showing how "With malice toward none, with charity for all..." fit in with the presidential style as the Civil War drew to a close. There was nothing Civil about the War Between the States, especially Lincoln's assassination, but the little book of Stories of the Civil War takes the overly familiar speech and sets it in place like a photo in an album. 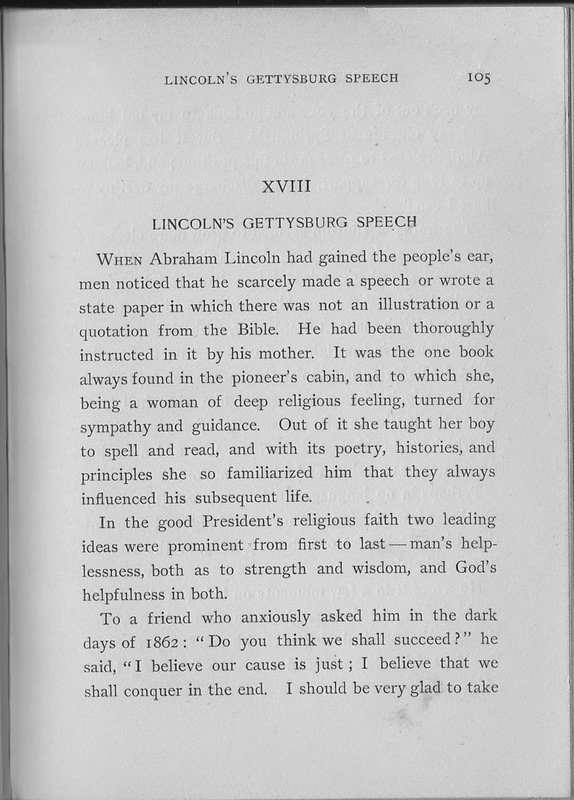 It shows how Lincoln's style developed from his mother's instruction in a pioneer cabin to that final inaugural address. The story's final paragraph is not the first time I've heard the story, but definitely shows that album setting. You may have noticed the battered condition of the book. Even this story was dog-eared by its original owner, Florence Grace Tucker, who also liberally made use of the book's final pages for penciled school notes and even a message to a friend. 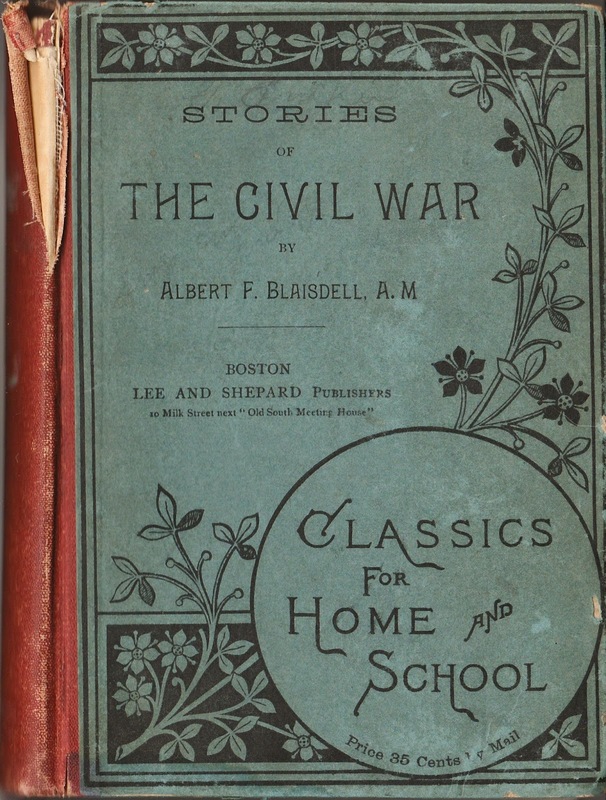 Earlier I featured this book in the story of "How a Boy Helped General McClellan." I found the tattered volume tucked away at Hyde Brothers, a delightful used bookstore in Fort Wayne, years ago and treasure its many stories. 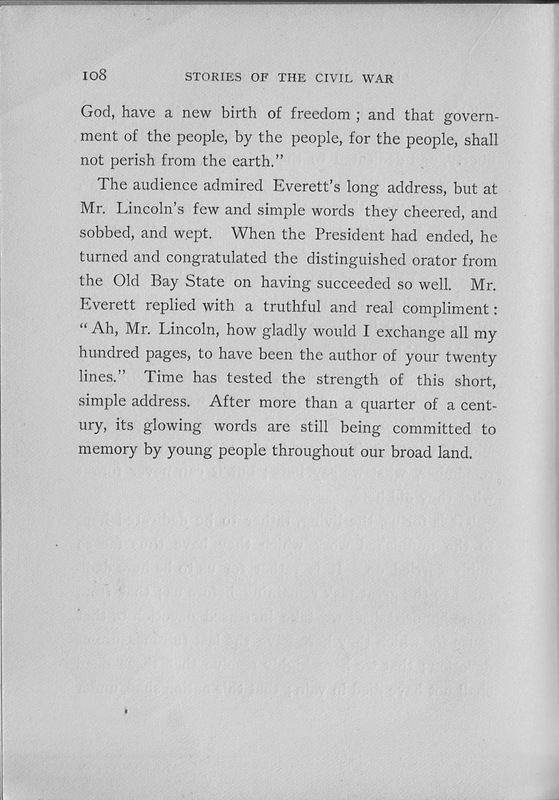 An edition can be found at Hathi Trust Digital Library, where you might enjoy the tenth chapter, "A Pen Picture of Abraham Lincoln." It's not really a story, but impressions of Lincoln. For information about the assassination, I recommend the March 2015 issue of Smithsonian magazine. You might also want to digitally visit the museum, searching the collection for Lincoln assassination for images, videos, blogs, and a bit more.